Now if you're willing to watch this magnificent 82 minute movie made in 1987, I promise you, you'll defiantly see a 'great wall' of some description. 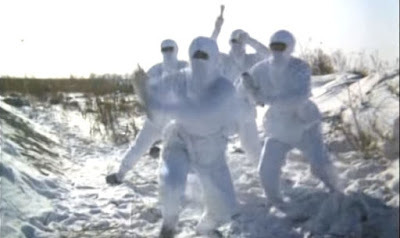 And if not a wall, I'd bet you anything you'll defiantly see a ninja beating the living Wok out of that Director chap: Kim Hui Lim; or one of his Actors: Bruce Le, Shikamaru, with Ning Li. Hai-yaaa! Hey, you Japanese b*stards! Do you see that coffin I've delivered to you, here, today? Well, I have a pretty good reasons why I've placed it at the foot of you Bushido school. Or three, to be more precise. Now my first reason is because your fellow countrymen drove me and my girlfriend (Ning Li) away from our hometown, by beating me up before dumping me into a shallow grave. My second reason is because your master's son, Sha Jiro (Shikamaru), just about managed to defeat my master in one on one combat. But as for my main reason, though -- ha -- you bunch of murdering twats know what my main reason is, don't you? Someone within your Bushido school has poisoned my master whilst he was recovering from his injuries. And that is why I, Chi Kung (Bruce Li), will do everything in my power to enact my revenge. Still. That's most probably why what next transpires all takes a nose dive when I get chased away by a pack of ninjas. As Sha Jiro walks a long and lonely path - Chi Kung takes an impromptu yet rather nice bath - a warrior gets ready to take his last breath - and at the Great Wall of China, a final fight ultimately ends in a lot of bloodshed and death. Now the only way I can explain to you how I feel about 'Ninja over the Wall', is by saying that it comes across like a made for television version of 'Fist of Fury' with some real kick to it. Yeah. I'm not pulling your leg, pal. In no uncertain terms this movie was a very good movie to sit through, plus it was an awful lot better than what I originally was expecting. Again, try to think of 'Fury's' premise, whilst adding to it three other factors as well. Firstly, a subplot involving a chivalrous Japanese masters' son seeking redemption. Secondly, some pretty atmospheric mood lighting, complemented by quite a few great fighting sequences. And thirdly, another great sub-plot pertaining to the hero's girlfriend's uncle being in cahoots with the bad-guys. Honestly. From my point of view the only bad thing I can say about this film, is that in certain scenes the lighting was so dark, you couldn't really tell what the f*ck was going on. And in addition to this, the overall narrative did have a rather peculiar way of unfolding itself, because just like many movies of this genre, it had a somewhat flimflam flavor to its conceptual structure. But apart from that, though -- nah -- this was one hell of a great film! And I especially liked its stoic attitude towards to the concepts of valor and self-discipline, which was rather self evident in that scene where Sha Jiro was told to kill the baby, as well as that scene where Chi Kung fought the ninja that was on fire. Oh! And while I am on the topic of great scenes, what I enjoyed even more than those I've just mentioned, was that intriguing sub-plot I referred to about the girlfriends uncle, because it did add a very suspenseful angle to the general story-line. Furthermore, that final fight scene was so f*cking amazing to gawp at; I personally thought it was well worth the price of admission on its own merit. Anyway. I best stop myself there, methinks. Because if I praise this picture any longer, I won't have enough time left to present you with these filmic-facts. (1) 'Gam Ma Film Company' first released this production in Hong Kong on the very same day that the infamous 'Loughgall Ambush' took place in Ireland -- the 8th of May, 1987. 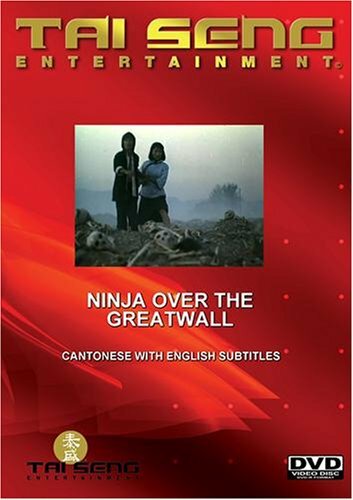 (2) Loosely translated, this project was entitled 'Ninja Bushido: Over the Great Wall' in Germany; 'The Challenge of the Great Wall' in France; and occasionally it has used the two alternate titles, 'Shaolin Fist of Fury' and 'Fire on the Great Wall'. (3) Now there's a bit of confusion surrounding Hwang Jang-Lee starring in this film, especially if you've read its DVD cover developed by 'Ground Zero Entertainment'. No. No Hwang in this film, folks. Mores the pity. (4) Also, another bit of confusion surrounding this adventure, is if it was released in 1990 or 1987. Again. No. It was in 1987. On occasion this type of movie has multiple-release dates depending on the region it's being released in. 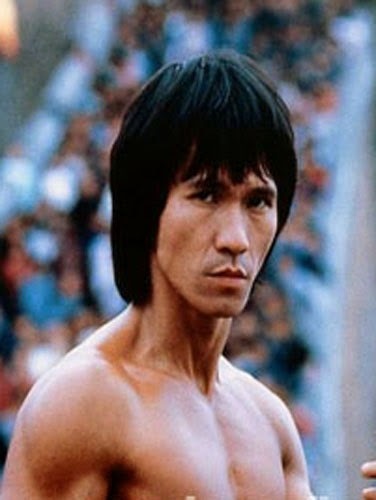 (5) Before he became a Bruce Lee clone, Bruce Le was hired as a contract player at 'Shaw Brothers', frequently appearing in a science fiction television series called 'Infra-Man' -- or alternatively -- 'Chinese Superman'. (6) Whilst Kim Hui Lim co-directed this flick with Bruce Le, and Hoi Pan Man wrote the majority of script this flick on his own, together, they've never done anything else in the industry except participate on this project. (7) It is generally considered that this was the best 'Bruceploitation' movie starring Bruce Le, with one film-buff going so far as to call it 'quite entertaining'. 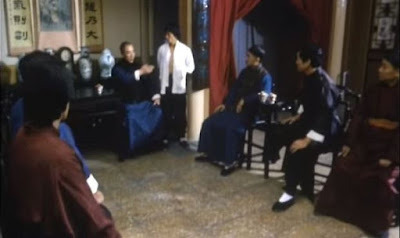 (8) After this flick flicked it's wick, Bruce Le starred in the action-film, 'Return of the Kickfighter'; Ning Li starred in another action film, '7 jin gong', and everyone else involved with this production disappeared into thin air, Ha! All in all I'd say 'Ninja over the Wall' was a brilliant film to sit down and watch. Despite not having Bruce Lee in it, and following similar lines than 'Fist of Fury', it still managed to entertain me, captivate me, and prod me along to recommend it as a must-see movie.